1) Remove and save the index screw from the lens base, for reversion. 2) Put the snip of tape around the bayonet, to shim-out the M39-M42 ring. 3) Squirt some glue around the bayonet -- just enough to secure the ring. 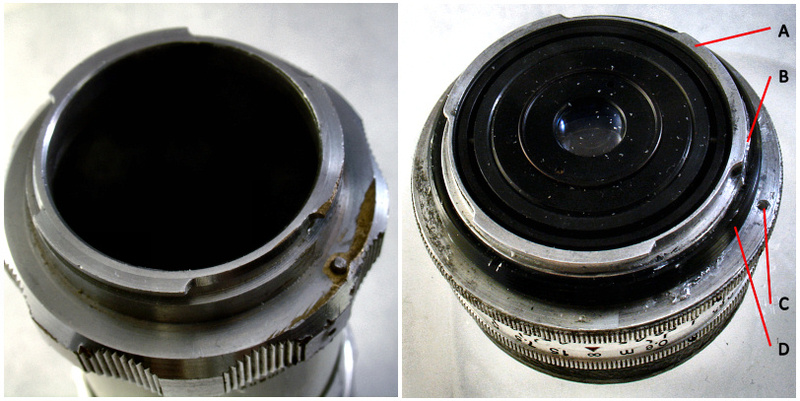 4) Place the M39-M42 ring around the bayonet, flush with the lens base. 5) Let dry for a few hours. Scrape off any excess glue with a razor knife. Look at the Bower-type M42-PK adapter. You will see a screw and clip. REMOVE THEM or the adapter will be TERRIBLY DIFFICULT to remove from a camera body. Notice that the adapter has 3 bayonet flags on one side, and a 48mm diameter flange on the other side. The flange is just over 1mm thick. We are going to grind off about 0.6mm from that. Now for the hard part. Tape the sandpaper (face-up) to a flat hard surface such as a large ceramic tile. Place the M42-PK adapter flange-down on the sandpaper. Use the sponge or pad to hold the adapter while you work, or your fingers will be sore. Swirl the adapter over the sandpaper to grind away the flange's thickness. Continue until the flange is a bit more than razor-blade thick. Without a micrometer, how do you know when you have ground away enough of the flange? Test the adapter on the lens. I have split-focus VF screens on my SLRs, so I simply focus at a horizon or distant object to determine if infinity focus is achieved. Grind and test, grind and test, repeat as needed. The register (flange focal distance) of an Exakta bayonet is 44.7mm. The register of a Pentax mount is 45.46mm. For perfect infinity focus on many lenses, you should remove about 0.75mm from the flange, but that might not leave enough material to seat securely on the PK mount. I removed 0.6mm from my adapter (first try). I can achieve infinity focus with a CZJ Tessar 50/2.8 (12 iris blades) and with a pancake Meyer Helioplan 40/4.5, but not quite with a Meyer Primagon 35/4.5 (infinity is about 5m). I guess I need to grind another adapter thinner. This approach is not rock-solid, but I wanted to keep it non-destructive and reversible. 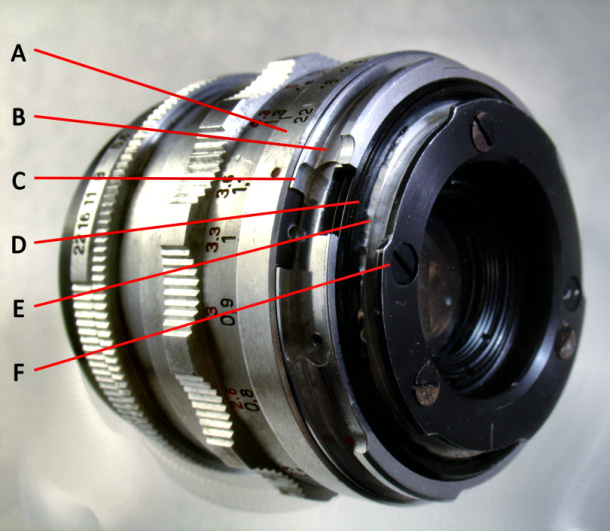 To revert the lens for Exakta use, just remove the adapters and glue, and re-insert the index screw. To secure the adapters for a more solid fit, drill-out and tap the hole in the M42-PK adapter where the clip was screwed down, and run a longer screw through both adapters into the lens body. I have not gone that far yet. And now I need to buy some more Exakta lenses for experimentation. This only enables and drives further LBA. I am doomed. Good job! It is nice to see other people willing to experiment. Could you please post some pictures on the process and/or the finihsed adapter?. I did not shoot the process -- the sandpaper grinding was my brother-in-law's idea, and his sandpaper, and his micrometer, done at his house, and was too boring to shoot. But I can show what is involved. 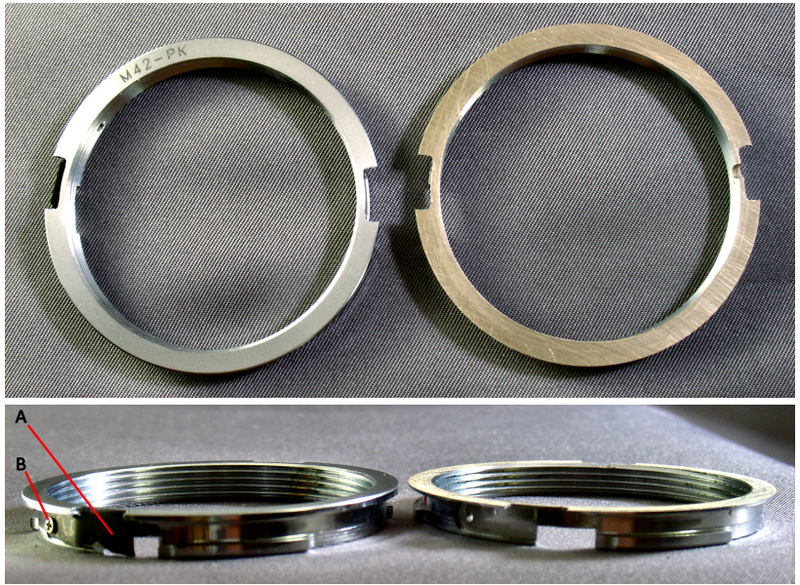 Next, modifying a M42-PK adapter: On the left is a plain adapter; on the right is a ground-down adapter. You can see that the grinding has removed some chrome and exposed the brass structure, and that the flange (on top) is thinner. On the far right you can see a small notch -- I will explain that below. On the plain adapter: (A) is the clip and (B) is the screw that must be removed. I cut the small notch in the modified M42-PK adapter in an earlier experiment. The notch was to allow clearance for the index screw to remain in the lens body. This did not work. I must say that shooting and processing these pictures above has taken much longer than the modification work did. Such a bother!